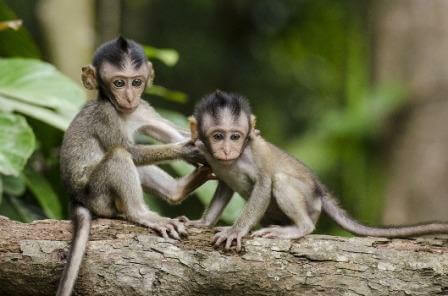 Bali monkey thieves - why are they stealing from tourists? This is a preview of a BBC series on the world’s sneakiest animals. It is the second episode showing cheeky Bali monkey thieves and was filmed at the Uluwatu Temple in South Bali. The monkeys (macaque species) at the Uluwatu Temple as well as in the Ubud Monkey Forest have a bad reputation for harassing visitors. This includes stealing objects that at first sight have no value to them, or does it? Check-out this YouTube video clip by the BBC taken in Bali. Other than at the Uluwatu Temple you can also find groups of monkeys at the Ubud Monkey Forest and along busy streets that cross through the mountains. The macaques are omnivores who eat a variety of plants and animals. They live in groups which can have from three up to twenty females, their young and one or many males. These social groups will generally have less males than females. The female macaques are the dominant ones.